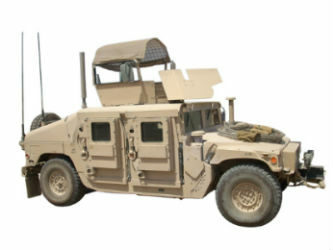 A military ground assault vehicle manufacturer approached SPIROL to provide quick delivery of adjustable Shim packs for spacing of armored vehicle door hinges. The spacing is critical to the welding process, providing proper sealing and locking engagement of the door systems. The customer designed an adjustable Shim pack based on surface bonded Shim material requiring 94 layers of 0.002" thick laminates. Because of the size and configuration of the parts, surface bonded materials were problematic in cost, the amount of time needed for dimensional adjustment, as well as a long lead-time required for manufacturing. A SPIROL Application Engineer worked with the customer to determine the required adjustment and developed three Edge Bonded Shim Set proposals. The customer evaluated the advantages and selected a proposal offering safe, quick adjustment, a 70% cost reduction, and a short manufacturing lead-time. SPIROL provided the solution without tooling cost using SPIROL's tool-less manufacturing technology. Edge-Bonded Shim Sets have all the performance and cost advantages of solid and loose Shims, but instead of having to stack a number of individual Shims, a single Shim set can be quickly adjusted to the desired thickness and slipped into position. In this way, variable close tolerances can be achieved saving considerable time required to pick various different thicknesses of loose Shims. The SPIROL solution provides cost savings by reducing assembly time, and also minimizes line side SKU's and related inventory storage space. The SPIROL Edge Bonded Shim Set also provides cost saving advantages over surface-bonded Shims because the materials are less expensive. Edge-Bonded Shim packs offer safe adjustment in seconds rather than time consuming and difficult to peel surface bonded laminates. Safety improvement is realized because no knife is needed to remove the edge-bonded layers. Cost savings can also be realized because removed layers are reusable functional parts. Our staff of engineers will review your application needs and work with your design team to recommend the best solution. One way to start the process is by submitting a Request for Quote.